Xiao Fan is from Beijing, China. He is now is a sophomore, and next semester he will be a junior. His major is mechanical and aerospace engineering. He likes sports, such as basketball and badminton and work out. He also likes listening to music and watch movies when he has spare time. He has published a paper in Artifacts Journal lately. Zongzi, a traditional Chinese food, is made of sticky rice stuffed with special fillings and wrapped up in Argy-wormwood leaves. Chinese people eat Zongzi during the Dragon Boat Festival to memorialize Qu Yuan, a famous Chinese poet who lived 2300 years ago in State of Chu inWarring States Period. An interesting legend of Zongzi has been passed down through generations from ancient China. Qu Yuan was a versatile government official at that time, and he was highly esteemed for his wise counsel among the common people. Qu Yuan was also the creator of Zongzi. However, the King did not like his straightforwardness, and some jealous officials said bad words behind his back. Sentenced by slander, Qu Yuan was exiled by the King. After his banishment to the remote countryside, Qu Yuan helplessly watched the gradual downfall of Chu and grieved that he could no longer serve his people. Out of despair, Qu Yuan plunged himself into the Miluo River. In order to keep his body safe in the water, many people threw Zongzi into the river to prevent the fishes from eating his body. It is said that Qu Yuan appeared in a fisherman’s dream, saying a flood dragon was in the River, and most of the Zongzi were eaten by the dragon instead of the fishes. He told the fisherman that the dragon feared Argy-wormwood leaves and five-color strings, and as long as those special materials would be added to Zongzi, his body would be protected. As a result, later generations celebrate the day of Qu Yuan’s death at every 5th day of May of the lunar calendar. Nowadays, Zongzi has become a symbol for Chinese people to express their homage to Qu Yuan’s spirits, such as his patriotism, selflessness, and righteousness; the festival of eating Zongzi and racing dragon boats help pass on the tradition of death ritual and filial piety to future generations. The legend, also, represents the heritage of dragon-worship that has deeply rooted in Chinese society. First, Zongzi is notable for education influence of Qu Yuan’s spirits. As a symbol of traditional Chinese patriotism, Zongzi is a moral heritage from the ancients. Chinese people cherish their time-honored traditions, and they show their respect for virtues such as righteousness, selflessness, and patriotism by eating Zongzi. As an advisor, he was upright to fight against the rampant corruption that plagued the government. He was so loyal to the State of Chu that he even risked his life trying to maintain the autonomy of his country. To articulate his grand love of his motherland, he began to compose beautiful patriotic poems that are now held as masterpieces. He swore to die or live together with the country, and he fulfilled his promise when the fall of the capital burst his last hope. More than a tasty food, Zongzi has turned into a national belief and a moral beacon in Chinese community. When families celebrate the festival and enjoy Zongzi, parents tell the story of Qu Yuan to children. In this way, Zongzi helps pass Qu Yuan’s spirits and traditional virtues to future generations, and he has been revered by Chinese people for two thousand years. Chinese people value their bodies as a way to protect their parents’ heritage, so it is disrespectful to the dead people if the body is eaten by animals. For another, many people believe that there’s another world for dead people’s soul, and the only way to come back from death is preserving the body intact. If one’s body were destroyed, his soul would become a wandering ghost and have no chance to reincarnation, which is very bad for ancient Chinese. Therefore, it would be extremely ominous and not filial if Qu Yuan’s body was eaten by fishes. Third, dragon-worship is at the heart of Chinese culture, which even pervades into culinary traditions such as eating Zongzi. Zongzi has become a medium to convey people’s admiration of dragon-worship. In China, the Gods of water are dragons, which are legendary creatures with auspicious powers such as providing timely rain for thirsty fields. The four dragon kings ruled the seas and rivers and controlled rains and snows. In Zongzi’s legends, a flood dragon is depicted as a powerful creature living in the river. 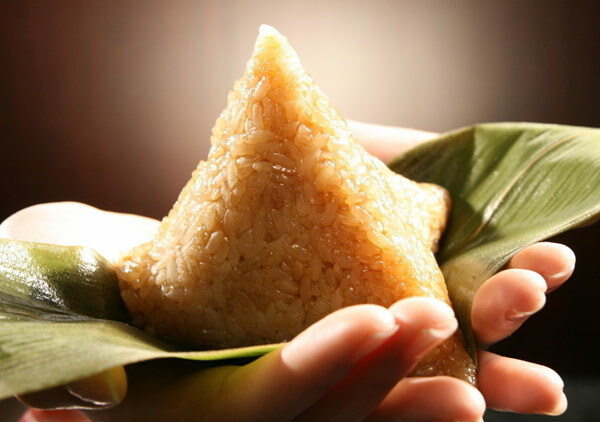 Some said that Zongzi is a gift for propitiating the dragon and beseeching protection for Qu Yuan’s body. Some said that Zongzi with Argy-wormwood leaves and colorful strings was created to scary dragons and feed fishes. It is interesting for controversies arising from those legends. We cannot figure out which one is the real version, but one thing for sure is the popularity of dragon-worship in Chinese society. During the Dragon Boat Festival, people also celebrate their reverent honor of dragons by racing boats and throwing Zongzi into rivers. Today, dragon-worship has become a unique culture phenomenon in China. Zongzi and Dragon Boat Festival help transmit the reverence of dragons and the active yang energy associated with it to next generations. Eating Zongzi has become a symbolic act for Chinese people to express their homage of Qu Yuan’s patriotism, advocacy of tradition of filial piety, and admiration of dragon-worship. Although the authenticity of the legend is uncertain, the spirit of Zongzi has deeply ingrained in Chinese culture. Zongzi itself does not have superpower, but the inheritance of Zongzi reflects how important Qu Yuan is in people’s mind and how valuable his spirits in Chinese community. Since 2008, the Dragon Boat Festival has become a Chinese statutory holiday, giving modern people a chance to better appreciate the culture and social meanings of the festival. Also, Dragon Boat Festival has grown into an international, celebrating event as many countries around the world are also taking on the tradition of eating Zongzi and racing dragon boats.